Through American Baptist Women’s Ministries CafePress store, you can purchase products imprinted with our new logo, AB GIRLS logo, or the two-year theme logo! Available products include baby bibs, coin purses, hats, blankets, jewelry, t-shirts, stationery, totebags, and even wall decals! There are many items to choose from! Price varies with the item selected. 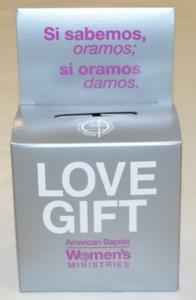 Orders for our promotional materials is processed and shipped from the American Baptist Women’s Ministries office. Orders are normally shipped within 5-7 working days. Shipping charges are calculated by the shipping address and the weight of the order. Website: The preferred and easiest way to order your promotional materials is through our online store. Online orders must meet a minimum of $5 to be processed. Credit card payment is required for online orders. Order Forms: Download the order form and mail your completed form and payment to American Baptist Women’s Ministries, P.O. Box 851, Valley Forge, PA 19482-0851. Phone: If you don’t have access to the Internet, American Baptist Women’s Ministries will take your order by phone. Orders will be accepted Monday-Friday, 8:00 AM-3:00 PM (Eastern Time); call (610) 768-2288. Credit card payment required.